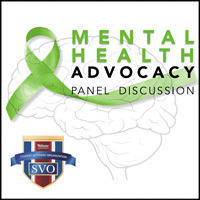 The Webster University Student Veterans Organization (SVO) will host a panel discussion to empower students, veterans and community members to take part in fighting the stigma surrounding mental illness, gain skills to identify signs of depression or suicidal thoughts, and provide tools and resources in the event of a crisis. Panelists are mental health professionals and those working in the suicide prevention and depressive illness fields. The event will be held Wednesday, March 21, at 5:30 p.m. in Browning Hall Auditorium, and is free and open to everyone.